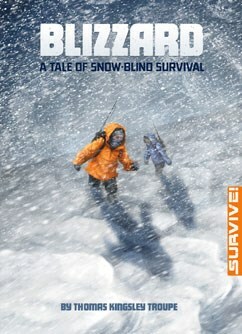 Blizzard: A Tale of Snow-Blind Survival | Thomas Kingsley Troupe — Writer. Filmmaker. Action Hero. Jeff and his best friend Keith are ice-fishing in the middle of Big Lake. It’s been hours without a bite, but they’re still having a blast ― until the storm of the decade closes in. Soon, the entire landscape is buried in three feet of snow and the snowfall shows no sign of stopping. With their heaters low on power, Jeff and Keith are forced to make their way home through the whipping wind, low visibility, and the ominous crackling of ice beneath their feet.